Club Penguin Cheats by Mimo777 Club Penguin Cheats by Mimo777: Rookie To Be At April Fools Party? Dood! Have you seen Rookie at the Club Penguin April Fool's Party? I have not seen him yet, but some of you have told me you have seen him. Have you met him yet? If you do, let us know! I just got somthing. CP dosnet start early, its probably just their time zone, which makes it right on time for them. Where exactly ca u meet Rookie? In Cp's various rooms or Box dimension or the various dimensions of Box dimension? Where do you actually find Rookie? All around CP or particularly in the Box Dimension or in the various dimensions of Box Dimension?? Will we get a Mimo Comment Rookie Tracker??? nah... havnt seen him yet!! i soooo wanna c him!!!! lol!! dude!!! pls comment!! I haven't seen him yet. I'll tell you if I do see him! MIMO! recycling plant is the spinning arrow room! Mimo, I think I just found a glitch, and I'm kinda sad =( I earned 'Food Fight', the stamp, but I completed the task for the other stamps but I didn't get them! The stamps aren't even in my stamp book at all! I dont think he would be at the box dimension because he is a nonmember. He got the glasses at the valintines day party and the propeller cap at the first april fools party. They fixed the tiny sumbrero being a member item glitch! I don't know if you can really meet him. It would be really cool though! But there us no stamp for him like the others, so who knows. MIMO ROOKIE IS ON ABOMINABLE IN SPACE DIMENSION! I GOT A BACKGROUND! in the coffee shop, the board (behind the coffee counter) now says "APRIL fools!" or when you click it it then reads "april FOOLS!" OMG! the recycling plant is now capital CRAZY!! Check it out! Can You send Me or Mimo picture of Rookie`s background? I can't meet him because I'm banned for 72 hours for no reason! 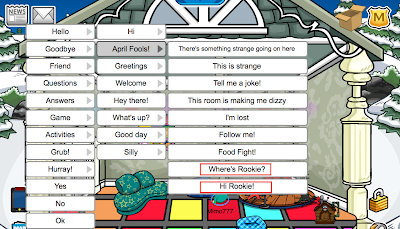 Hope its not just some April Fools joke...I haven't seen a single person with Rookie's background. The forest isn't upside down like last year!!! cool. btw if you look in the lighthouse while the april fools party is on, there is no music catologe! i can't have the background abominable is FULL! !